Jennifer Kloester has authored a MUST READ reference book for any avid Georgette Heyer or Regency period fans. What’s great about this book is that you can either read it all the way through or just pick it a chapter or subject at a time, whatever tickles your fancy that day or if you’re reading a book and come upon something you would like to have explained. 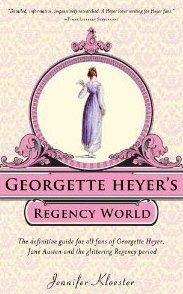 Kloester has obviously done her homework, and I feel that I’m walking away knowing a LOT more about the Regency period than I did before and it’s also renewed my love for Georgette Heyer! Passages to the Past highly recommends!! FTC DISCLOSURE: Thanks to Sourcebooks Publishing for sending me this lovely book for review. From reading the various reviews on this book I think I am very glad I am a child of my generation! Thanks for the review! I wish I'd tried to get this one to review myself! I checked at Borders yesterday and they had it on backorder...I'd have to wait six to eight weeks to get it! This sounds much better than I thought it would be. I saw it on Burton's Review also. I'm glad you found it so informative. Can you imagine having to be so proper and precise? Wow. I like the part about reading chapters that you want. That is good! Thank god I am living in the present age. I will be getting this book. It is just the type I like to read, reference, but a good read just for itself. I know I'll enjoy it. Even better, I don't have to read it all the way through, just do chapters when I like.